The deodorant contains Lamazuna particular essential oil palmarosa, whose role is to snack bacteria! So sweating is not prevented, it is simply rendered perfectly odorless, which is much better for your body. 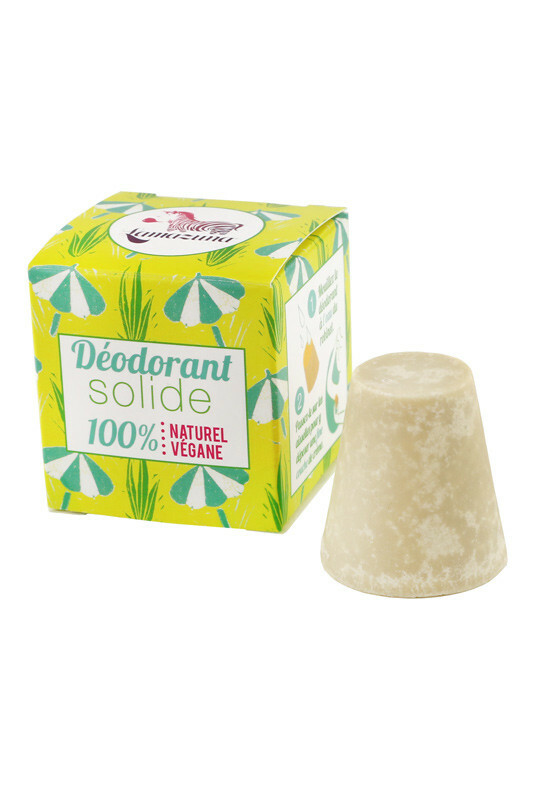 French hand-made deodorant is 100% natural and vegan origin, more effective than alum stone and other aluminum-free deodorants. 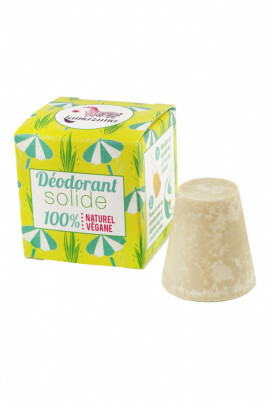 Eco-friendly and money wise, its longevity is worth 2 deodorant sticks. Weight: 30g - Zero waste compostable box ! How to use your solid deodorant Lamazuna? Wet your deodorant with hot or cold running water, then wipe it on your armpits, or rub it directly on your armpits still wet after a shower. A thin layer of cream will settle on your skin, that's enough to be effective! Precaution: our solid deodorant contains the essential oil of Palmarosa and sodium bicarbonate. These products enable our deodorant to be particularly effective, but we recommend that you be vigilant when using it if you are sensitive or allergic to any of these components. The essential oil of palmarosa is strongly discouraged for pregnant and lactating women and children under 3 years. How to keep my solid deodorant between uses? You can simply place it on a saucer or a soap dish on the edge of your sink. If you prefer to shelter from dust, mini jam jar or an old jar of cream suit. In all cases, no concern for its conservation, it is anti-bacterial so it can not be dirty! What amount of solid deodorant should I use and do I risk white marks on my clothes? When you place your solid deodorant on each armpit, it must be well wetted and depositing a thin transparent layer on the skin. It should slide as a bar of soap between wet hands. This film will dry quickly and will not leave white marks on clothes. For maximum efficiency, I recommend you thoroughly cover the armpits from top to bottom and right to left. A good thin blanket will be more effective than one thick layer too localized. How to transport my solid deodorant sport or traveling? Mini pot glass jam jar old cream or washcloth will be very practical. What is the difference between an antiperspirant deodorant and solid deodorant? As its name suggests, an antiperspirant deodorant will prevent perspiration to evacuate while our deodorant will nibble the bacteria in sweat before they can release an unpleasant odor. Effective antiperspirant use aluminum salts, which close the pores of the skin. These aluminum salts are deemed dangerous, after many ancient and recent studies. A study by K G McGrath concluded in 2003 that breast cancer occurred eight years earlier in women shaving their armpits and using an antiperspirant than those not using. The study is available here. Shaving underarm allows the aluminum to penetrate more easily into the body. It is by reading this information I stopped using antiperspirant and I went to the alum stone and deodorants "to the alum stone", but none were quite effective against odors. That is why did this solid deodorant Lamazuna obviously without aluminum! 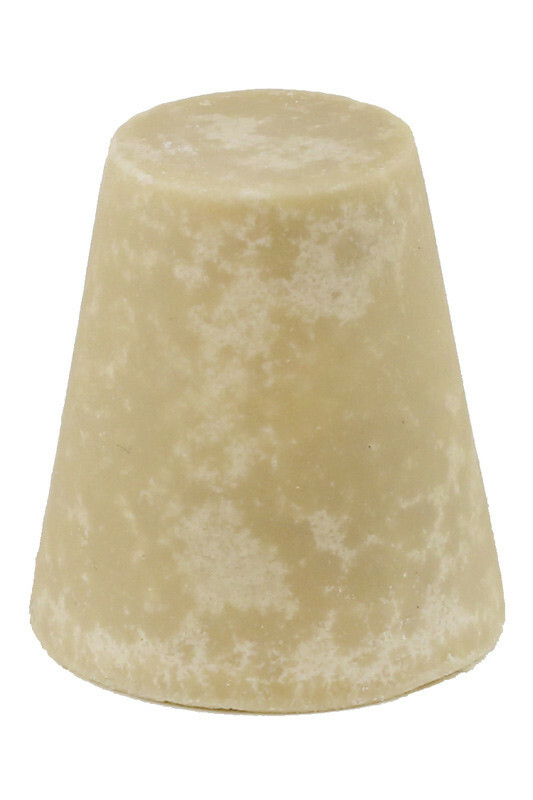 Helianthus annuus seed Cera *: This shot of sunflower wax gives our deodorant its solid consistency, in addition to soothe and soften the skin. Cymbopogon martini oil *: Palmarosa essential oil, nibbling bacteria. It is thanks to her that our deodorant is also effective!